Nestled back in a corner of a quaint little neighborhood behind a beautiful gate is where you'll find this charming move-in ready 3 bedroom, 2 bath home with attached 2 car garage and a workshop room in the finished walk-out basement. Home has a very large open kitchen, dining & living room area complete with eye catching kerosene heater with gravity fed fuel that sits atop a gorgeous locally sourced slate hearth. Spacious kitchen with cook-top on the functional island also offers plenty of counter space for prepping for those summer or holiday get togethers. Down the hallway you'll find the 3 good sized bedrooms including the large master bedroom with full bathroom and walk-in closet. Step out of the master bedroom slider to a covered deck where you can watch the local birds & wildlife while you sip your morning coffee. 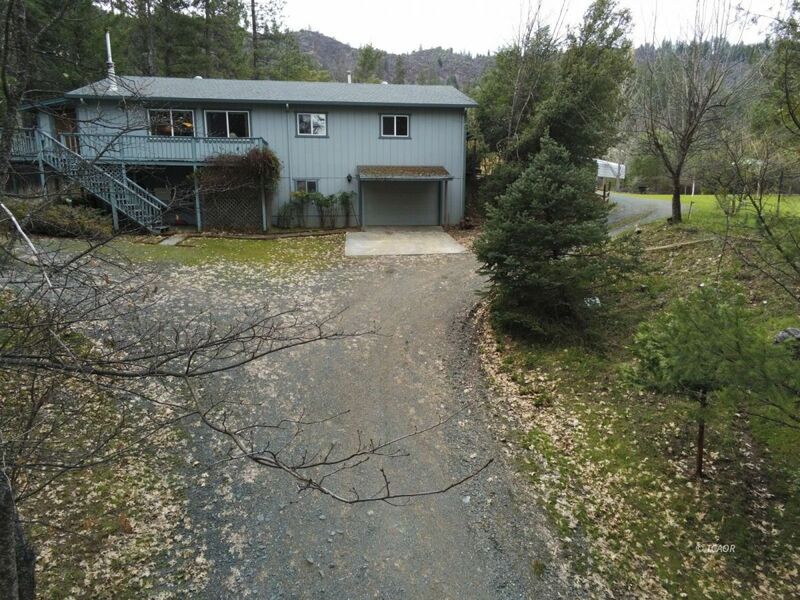 The 1.12 acre property offers plenty of space for your RV, a detached 2 car metal carport, 9 fruit & nut trees including apple, pear, plum and walnut as well as a lovely sunny garden area just waiting for your green thumb. Seller may consider carrying with substantial down and agreeable terms.